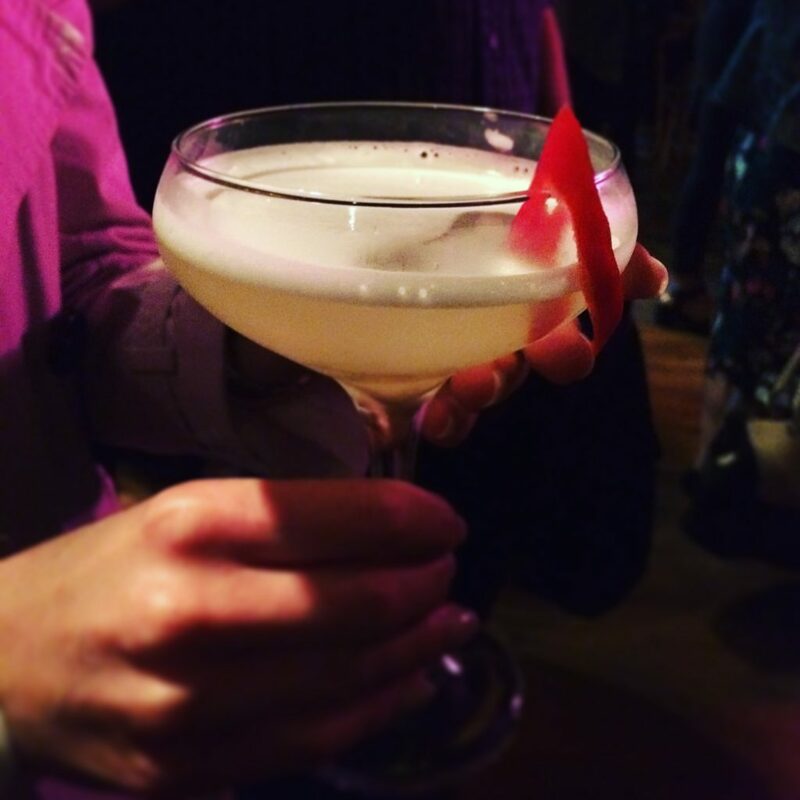 Last month I went to the launch of EPIC cocktail bar (which used to be Brooklyn) on Call Lane. Despite the cringey name and an unfortunately long queue for drinks, there were some rather tasty cocktails being served. I had a Siam Daiquiri – Koko Kanu (coconut rum), lime juice, sugar syrup, ginger beer and a very large chilli! It got me thinking about how many ace cocktail bars there are in Leeds. There are some brilliant places to enjoy a cocktail, whether you prefer exotic flavours or traditional concoctions, beautifully presented and often made with a bit of showmanship. 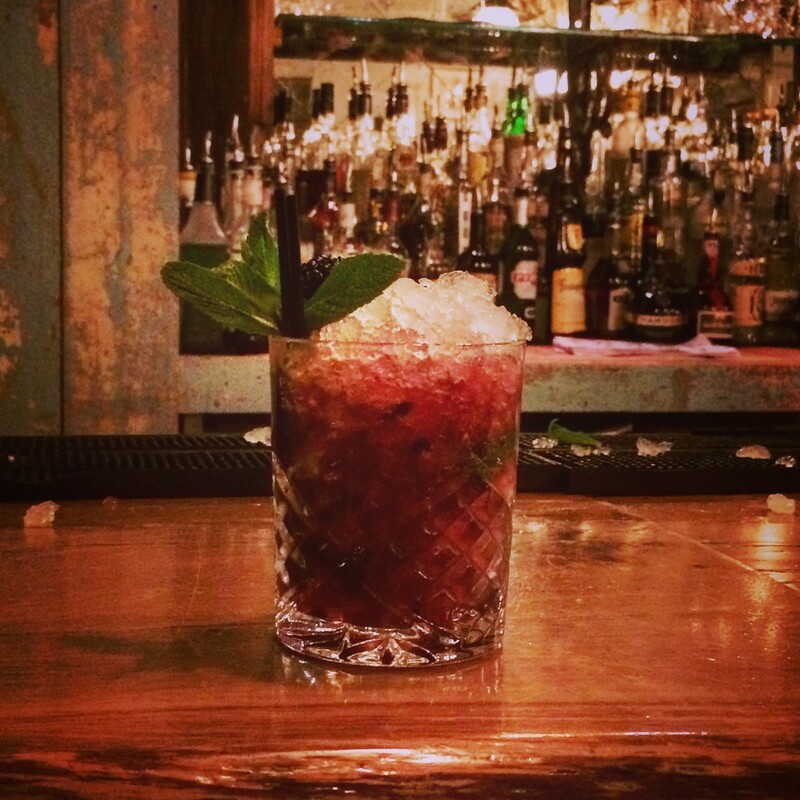 Blind Tyger is a hidden gem tucked away in-between Belgrave Music Hall and Sandanista. This place is just… cool. It’s quite small, which gives it a nice intimate vibe, and rather than having to queue at the bar for ages, it’s table service. The bar staff all really know their stuff as well which helps. 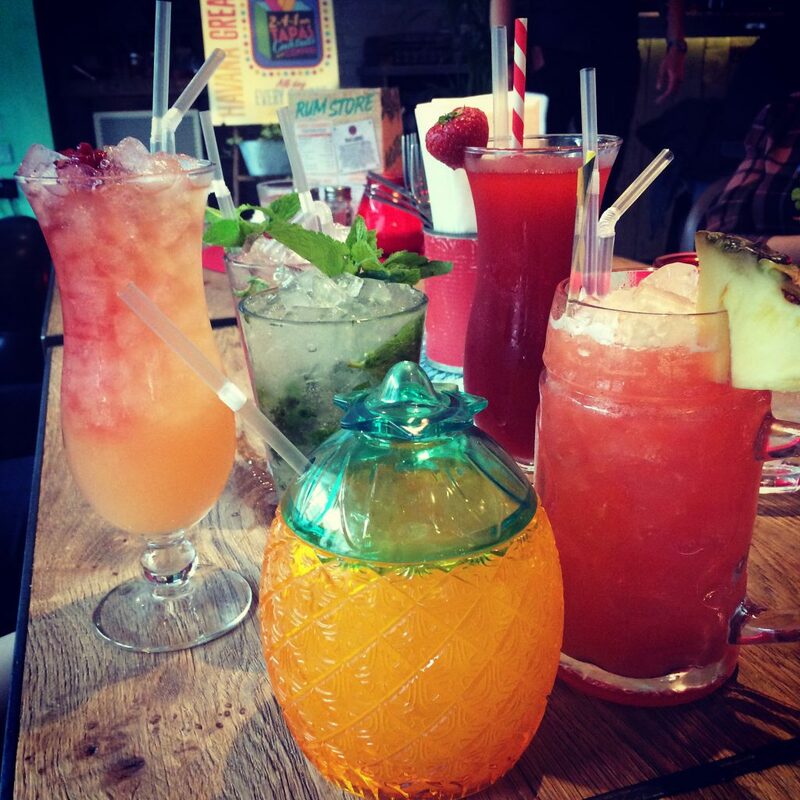 The drinks are a bit on the pricey side (for Leeds) but are well worth it. You’d come here for something special (it’s a pretty good bar for date night – complete with pretty fairy lights) rather than a stop-off point on a bar crawl. I think Dan only likes an Old Fashioned because he thinks it will make him more like Harvey from Suits… Either way, Smokestack is another great bar. It’s owned by the same group who own Blind Tyger (and also Sandinista and Black Swan). I tend to go here on Thursdays (when I forget that drinking on a school night is a bad idea) so can’t comment on what it’s like at the weekend. They’ve got a great cocktail menu and I love the speakeasy feel to it inside. I keep meaning to go on a Sunday night (if I ever have Monday off!) as they’ve got live blues bands on from 8pm. I did a cocktail making class here as well for Lorraine’s hen do which was fun. They even let me play with fire – fools! Look how excited I am at the idea of fiery cocktails! Another Old Fashioned! Are they just really “in” at the moment? With the Alchemist you get a lot of theatre. On the website it states that the Alchemist “celebrates molecular mixology, alchemy and craftsmanship” – fancy eh! There’s definitely a mad scientist (but also elegant and trendy) vibe here – some of the drinks get served in conical flasks for instance, and there’s plenty of dry ice around. I must admit I’ve not been since it opened – I felt it was focused more on style over substance – but would definitely go back for another try. It’s a good place to start a girly night out (or end a day of shopping) and if you can get out on to the roof terrace, it’s even better. Favourite drink: All of them! 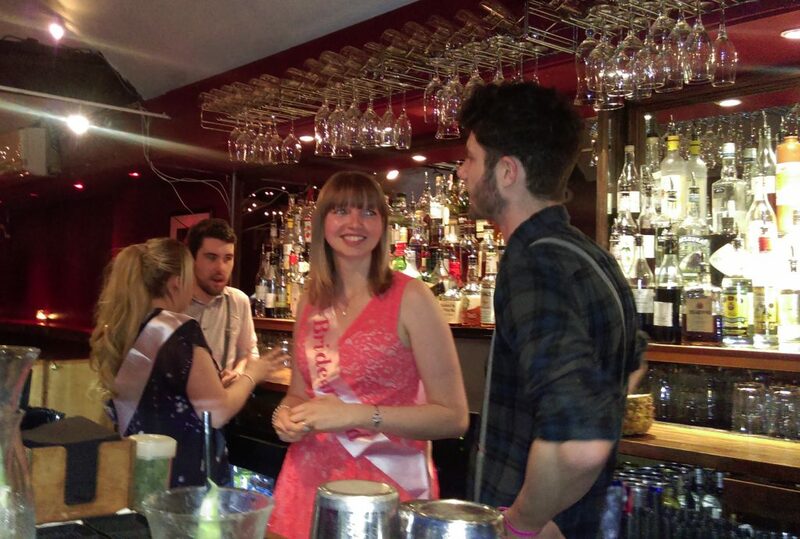 If you’re already at The Alchemist in Trinity, you might as well go one floor higher and visit Angelica. Angelica is very fancy. It boasts impressive views of the city in a very chic environment. It’s a great place for special occasions. (Kirsty and I stopped off here for a drink on Treat Yo’Self day.) It’s not cheap, but not extortionate either – although be warned, there is a table service charge. If you’re not one for ostentatious cocktail bars, you could head to Meat Liquor, below Trinity. I’m actually not a massive fan of the food at Meat Liquor, but there’s a fun party vibe and apparently the drinks are good. Bash says the House Grog is a winner – with that much rum listed in the description, it sounds good to me! Favourite drink: Any if you like tequila! I haven’t actually been here, but wanted to include contributions from both Brancker boys! Apparently it’s a must if you’re a tequila fan. Maven’s not the kind of place you stumble across – you have to know about it first. As a prohibition themed bar, there’s no sign outside – only black steps leading up to a black door. It’s near the Corn Exchance, past Blue Rinse and the Rock Bar. If you want a drink that’s not on the menu, just ask for it. I’ve always gone for cocktails served in a big ornate bowl before – you start off by carefully ladling the cocktails into your dainty cups, but by the end of the night you just stick your cup into the bowl and cut out the middle-man! The Hedonist Project is reinvented every three months. Starting as a gin bar, it then appeared as Rum Shack – which I will always remember as the bar where I got a banana from – next to Sandinista, before turning into a liquor and whisky bar and then Old Tom’s Gin Kitchen. It’s currently Trader Dan’s Surf Shack. 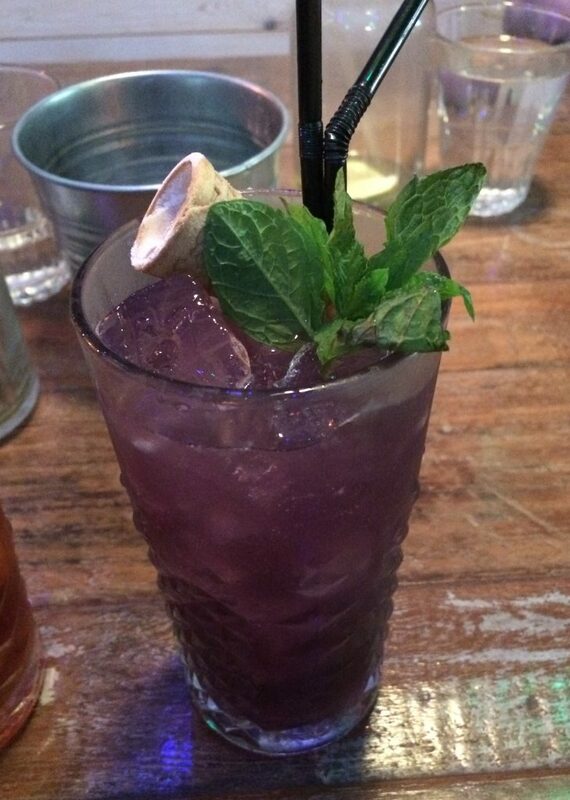 I went here on Friday and had a Black Magick: Goslings Black Seal Rum, Black Falernum and bitters. I normally go for something sweet, but the description on the menu got me (I won’t spoil it for you and will let you read it when you go there instead.) It was delicious. After my colleagues all took a sip we all agreed that it was a very adult drink. I don’t think I’m quite grown-up enough to handle it. Okay – so apparently the Rusty Nail isn’t actually on the cocktail menu, but Richard said this was his favourite drink and they were happy to make it for him. The Sky Lounge is another classy date night bar, with lovely views of the city. I remember going one year for a Christmas work night out and asking for something that tasted Christmassy. I was served a cocktail that tasted like gingerbread and butterscotch Angel Delight – it was heaven. Mook has a 2-4-1 deal (on the same cocktail) before 9pm, and the cocktails are pretty cheap anyway, so this is a great place to start the night out. You have to work out your strategy beforehand though – are you going to split the deal between a friend, or just get two drinks for yourself in one visit to the bar? They’re not the most sophisticated or fancy cocktails, but if cheap and cheerful is what you’re after, it’s a good place to go. 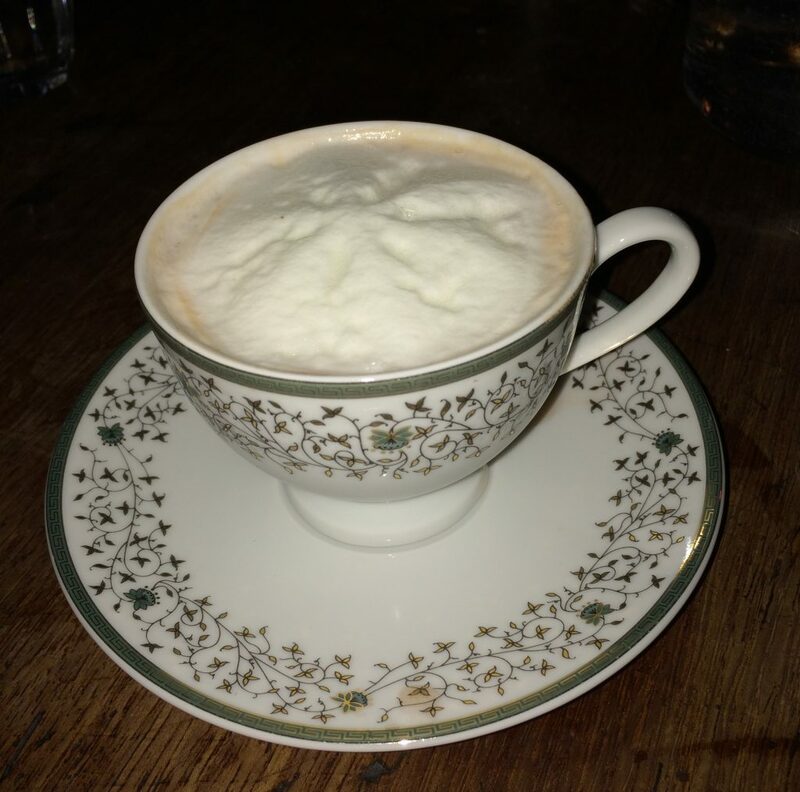 I’ve already blogged about the Botanist so I’ll keep it short. I love the Botanist for its unusual cocktails made with fresh ingredients, greenhouse vibe, and live music. It gets pretty busy though so I only go early on in the evening or midweek. Be At One is fast becoming one of my favourite bars in Leeds. They often have 2-4-1 deals on, which makes it a cheap night out, and they have a really extensive menu. I think it sometimes gets overlooked as a ‘proper’ cocktail bar because it’s not pretentious – it’s more fun than fancy – but I really like it. They always have great music on – songs to dance to like Tina Turner and Diana Ross (and more current stuff as well of course) – and the staff have all been lovely every time I’ve been. I went a few weeks ago on a Sunday for Becky’s birthday. We ended up staying there for seven hours. SEVEN HOURS! On a Sunday! 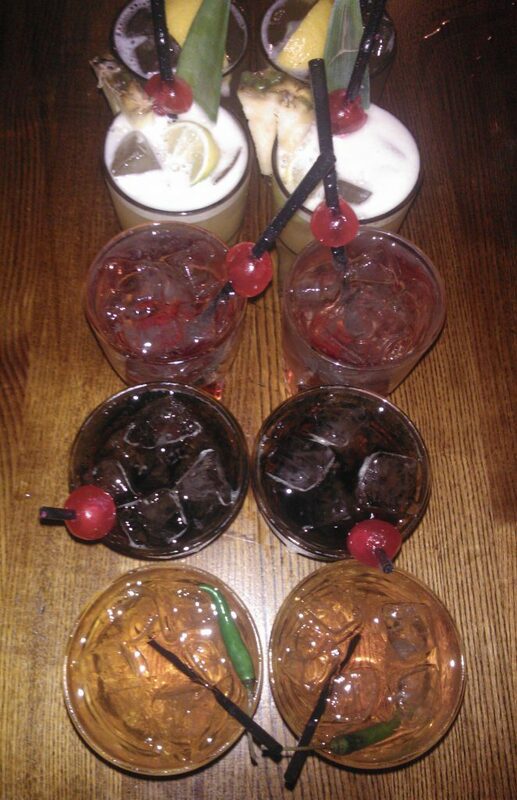 Which meant between the six of us, we did manage to get quite a way through the cocktail menu. I absolutely love the Blueberry Muffin cocktails – they taste just like blueberry muffins, as the name suggests. I also love the Irish Disco Biscuit – Baileys, crème de menthe, Oreo cookies and vanilla ice cream – half pudding, half drink! There’s also the Tikki Hideaway, which you have to go through Call Lane Social to get to (try the ones that get set on fire!) and Revolución de Cuba (their happy hour is until 7pm and you can get it on different drinks – I’d recommend their Strawberry Daiquiris). There are so many other places as well but I’m going to have to stop otherwise I’ll go on forever. 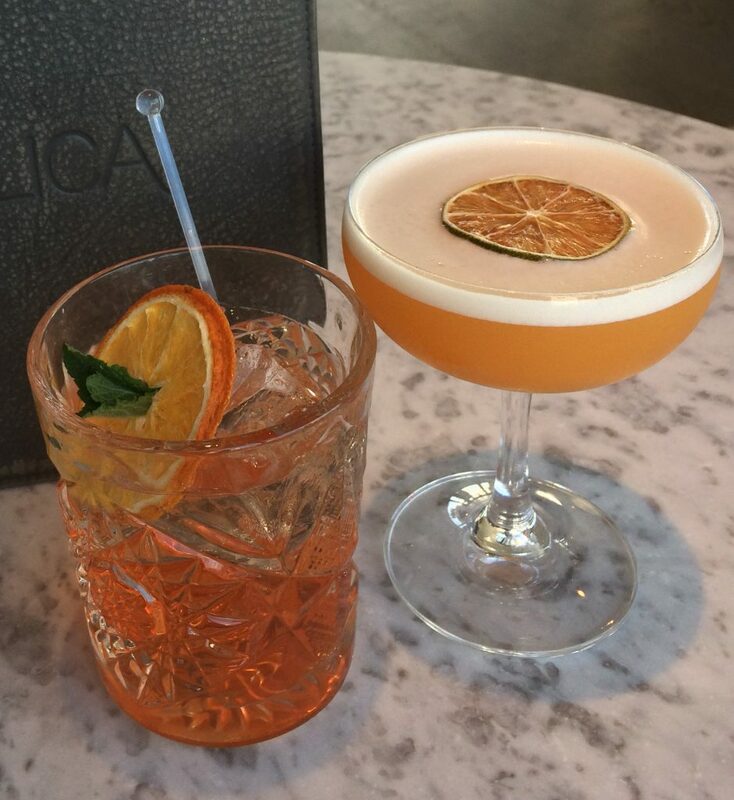 Let me know if you’ve got a favourite Leeds cocktail bar that I’ve missed off the list – it will give me a reason for another night out drinking cocktails!